Yet, today, I am far less nervous about stepping off a plane, 3,000 feet in the air, than I am about looking down from the roof of a fifteen-story apartment building! My first jump was made from a hot-air balloon at Excelsior Springs, Missouri. The professional jumper who had contracted for the exhibition had broken his ankle in a bad landing. I offered to take his place, climbed onto the trapeze, and away we went. When the balloon got as high as it would go, I pulled the knife that cut us loose. I sailed four miles and came down in the middle of a big watermelon patch. The farmer and his wife ran out and the farmer said: “‘By golly, I have had ’em come into my patch from all angles, but this is the first time anybody came in from the air.” He gave me the biggest sweetheart melon in the patch. Just then, the reception committee, wearing high silk hats, drove up in a limousine. They had to sit on each other’s laps on the way back to make room for the melon. For airplanes, three types of parachutes are used: the seat-pack, back-pack, and chest-pack. The first is standard for pilots. The back-pack is an exhibition ‘chute, and the chest-pack is usually employed with a back-pack when a double parachute drop is made. On any of these types, when the rip cord ring is pulled, the canvas case of the pack is snapped back by rubber cords and a small pilot parachute is shot out by a spring. This drags the main parachute out, decreasing the time required for it to open. About two seconds after the ring is pulled, the ‘chute is completely open. Fully extended, the average chute measures from twenty-two to twenty-eight feet in diameter. One twenty-four feet wide weighs about eighteen pounds and costs $350. 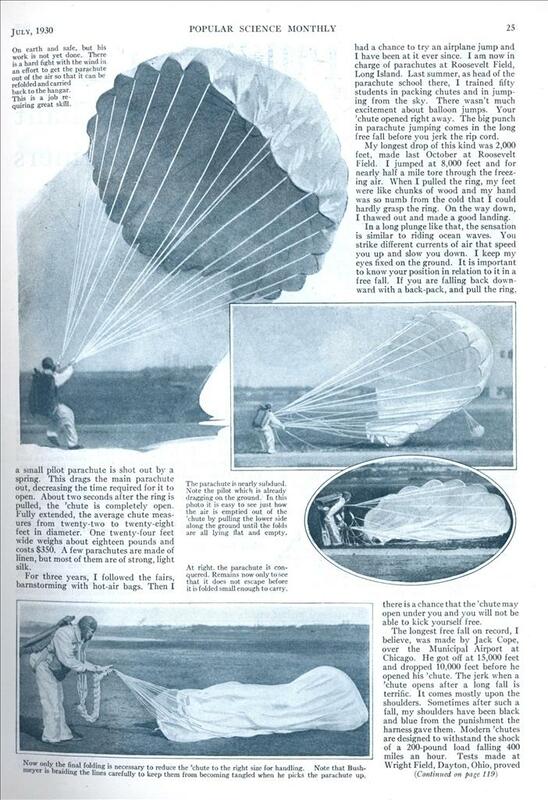 A few parachutes are made of linen, but most of them are of strong, light silk. For three years, I followed the fairs, barnstorming with hot-air bags. Then I had a chance to try an airplane jump and I have been at it ever since. I am now in charge of parachutes at Roosevelt Field, Long Island. Last summer, as head of the parachute school there, I trained fifty students in packing chutes and in jumping from the sky. There wasn’t much excitement about balloon jumps. Your ‘chute opened right away. The big punch in parachute jumping comes in the long free fall before you jerk the rip cord. My longest drop of this kind was 2,000 feet, made last October at Roosevelt Field. I jumped at 8,000 feet and for nearly half a mile tore through the freezing air. When I pulled the ring, my feet were like chunks of wood and my hand was so numb from the cold that I could hardly grasp the ring. On the way down, I thawed out and made a good landing. In a long plunge like that, the sensation is similar to riding ocean waves. You strike different currents of air that speed you up and slow you down. I keep my eyes fixed on the ground. It is important to know your position in relation to it in a free fall. If you are falling back downward with a back-pack, and pull the ring. there is a chance that the ‘chute may open under you and you will not be able to kick yourself free. The longest free fall on record, I believe, was made by Jack Cope, over the Municipal Airport at Chicago. He got off at 15,000 feet and dropped 10,000 feet before he opened his ‘chute. The jerk when a ‘chute opens after a long fall is terrific. It comes mostly upon the shoulders. Sometimes after such a fall, my shoulders have been black and blue from the punishment the harness gave them. Modern ‘chutes are designed to withstand the shock of a 200-pound load falling 400 miles an hour. Tests made at Wright Field, Dayton, Ohio, proved wing, open the ‘chute, and let it pull you off. This is the easiest, but in some ways the most dangerous. If the ‘chute accidentally opens and becomes tangled in the bracing wires, the plane will be pulled into a spin and nothing can save you. The second method is to dive overboard and then pull the ring. A jumper should count at least four before pulling the rip cord, as the ‘chute strings up thirty or forty feet and may catch on the tail of the plane, tear, and pull the ship up into a stall and a spin. A novice should jump with his hand on the ring but be careful not to pull it too soon. I get off with my hands up in the air and in all sorts of positions and I have never had any trouble about finding the ring while falling. ONE woman student made my hair stand on end last summer. I told her to count five before pulling the rip cord. She dropped and dropped. I thought she never would open the ‘chute. Finally, it blossomed. I asked her how she counted. She said: ” Like this, one”—pause of about a second—”two”—another long pause, etc. Something like a music teacher. I gave an even worse scare than that to the crowds at Roosevelt Field, last fall. I wore three parachutes and jumped from 3,500 feet. I pulled open the first ‘chute. It was fastened so it would tear loose, and I plunged on. The crowd thought I was a goner, sure. Then I opened the second ‘chute. They breathed a sigh of relief. I let it tear away and dropped another three hundred feet before) I ripped open the last ‘chute, which was fastened on, and drifted down to an easy landing. Last Easter, I had a grand time amusing the 15,000 people who came to the field to see Lindbergh come in on his record-breaking transcontinental hop. Randy Enslow, Lindbergh’s old barnstorming partner, took me up, dressed in a rabbit costume with ears a yard long. I drifted right over the grandstands and wiggled the ears at the crowds as I sailed past. Several times, when I have jumped with students, we have come down so close together that I could talk to them and give advice about landing. It is queer the way your voice sounds up in the air. There are no echoes. Your voice is flat. Sometimes, when I make jumps at the field on week-ends, I can hear the announcer telling the crowds about the jump while I am still a thousand feet in the air. The sounds which seem to penetrate upward clearest are the barking of dogs and the whistle of locomotives. The latter sound once gave me the scare of my life. I was making a radio jump north of Roosevelt Field. Around my waist was strapped a miniature forty-pound broadcasting set. The average parachute weighs eighteen pounds. I weigh 160 pounds. So my twenty-eight-foot parachute was pretty heavily loaded and I dropped faster than I had expected. I was broadcasting away, telling everybody what a grand time I was having, when I heard the piercing whistle of a Long Island train rounding a curve a mile away. I LOOKED down. In the grip of a powerful down-current the ‘chute was drifting straight for the track. I tried to “slip” out of the descending draft, but this only increased the rate of descent. I loosened the harness straps across my legs, prepared to jump at the last second. After what seemed an hour, but probably was half a minute, the downcurrent ended with a bump. The descent slowed down and the ‘chute sailed across the tracks two or three hundred feet in the air while the train roared past beneath me. I decide where to get off a plane in order to land at a certain spot by noting the wind velocity and then figuring out how high and how far from the field I will have to be. The stronger the wind, of course, the farther the parachute drifts. I have jumped in thirty-five-mile winds. When I landed I was dragged a hundred yards before I could “spill” the air out of the ‘chute by pulling back on the cords on one side. In coming to earth in a wind like that, you are traveling thirty-five miles an hour horizontally and dropping at the rate of about ten miles an hour. So you hit with a smack. In a dead calm, I can almost bring a ‘chute down on a quarter and have fifteen cents change. By pulling down on the lines on one side, I can make the parachute sideslip in that direction about ten feet for every hundred feet it drops. However, the lines must not be pulled down too far in making a slip. If this is done, the parachute starts to spiral around the low side, winding up the lines and closing the mouth of the ‘chute. If the winding continues, a parachute “spin” results. The ‘chute pinwheels with the low side at, the center, the speed increasing rapidly. THE fastest descent from plane to ground that I ever made was a 2,500-foot drop accomplished in sixty seconds. That meant an average vertical speed of about thirty miles an hour. I dropped 1,000 feet before pulling the rip cord. Then I slipped hard to within fifty feet of the field. When I let go of the lines, the ‘chute opened fully at once and let me down for a gentle landing. Exactly opposite was a jump I made this spring. I yanked the ring as soon as I got away from the plane and drifted down like a dandelion seed. The air seemed perfectly calm. It looked as though I would sit down gently enough to land on eggs. But at the last minute, just as I drifted over the hangars, a sudden downcurrent of air caught the ‘chute and I landed with a whack. Another unexpected ending to a jump was also due to a sudden gust out of what seemed to be still air. I had sailed along above a line of telephone poles beside a road. For perhaps an eighth of a mile I drifted exactly above those wires as though I were attached to them. About fifty feet above them, I slipped the ‘chute to one side so I would come down in the road. But while I was looking at the road to see where I was going to land, the gust swung me back and I found myself sliding along the wires wearing little grooves in the seat of my trousers. I got loose from my harness in a split-second and sat there feeling foolish while one of the boys from the field got a ladder. NIGHT descents have given me my weirdest experiences in ‘chute jumping. I have made ten or more. I plunge through inky darkness, then jerk the ring and float down with all the tiny yellow lights of Long Island spread out below me. On the most exciting of these drops, I carried fireworks and set them off on the way down. As I swung the flares around my head, the fire and sparks were carried upward by the rush of air. They curved around the edge of the ‘chute, forming a great question mark of fire in the darkness. In recent years, improvements have been made in parachute design. Different shapes are being tried. The refinements are mainly in the direction of greater ease in steering and in greater speed in opening. The other day, I figured up that putting all my jumps end on end I have fallen through the sky more than 100 miles. 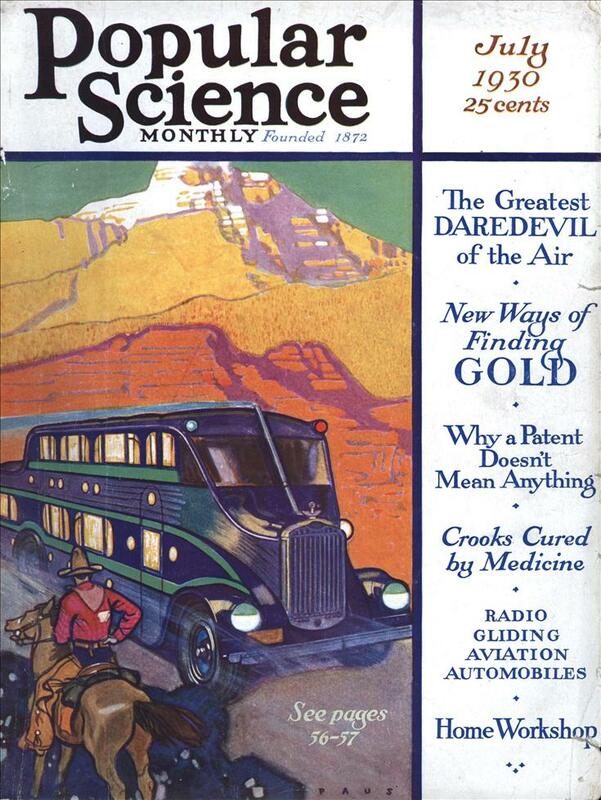 Stepping out of solid planes into thin air and rocketing downward at two miles a minute has become commonplace. Yet, my only injury has been a sprained ankle. Parachutes may not be as safe as rocking-chairs, but they have been good to me. And they have given me seven years of thrilling adventure. Page 119 is missing. Could you please scan and post it?